This happened in the following way: Karl Skollaude from the house number 74 in Vratislavice on the left bank of Neisse river in the autumn of 1862 dug the well beside his house on the meadow near Neisse, for a pump that had to supply his bleach with water. The well is situated to the southeast of the named house, in the place where the hill is set to rise southwards. The well has a depth of 6 cubits *, of which about a quarter had to be recessed into granite stone. There were three water veins in the cracks of this granite, which filled the well so high that a pump tube could be inserted, but this did not happen until the spring of 1863, when the owner began to operate his bleach again. The water of the new well had a special flavor that was first attributed to the new well pipe and the gunpowder used to break the rock; but when the flavor, even after a long time, was not lost, the water was labeled as bad, unsuitable for ingestion; the inhabitants of the house went on to take water to the wells used so far, and water from the pump was used only to run the bleach. So it remained until August 1865, when the owner's mother (Mr. Skollaude's mother) found that the flavor of the water from the new well was very acidic and expressed herself to the other inhabitants of the house as follows: it tastes almost like the mineral water in Libverda. After repeated remarks of this lady, despised water was examined more carefully, and the acidic, delicate, sparkling flavor was found, and when it was left in the glass, bubbles rose. All of them were pleasantly surprised, Mr. Skollaude filled the water into a bottle and went to Jablonec to pharmacist Ulrich to conduct a water analysis. His analysis had a favorable result and he said that Mr. Skollaude is a happy man who discovered a valuable mineral spring and encouraged him to let the water analyze by a chemist. To this end, Skollaude first turned to Doctor Weiskopf in Smržovka, who discovered chemical minerals and gases in chemical research in the water. When this news about mineral water in Vratislavice spread in the area, several people remembered the remarkable statement of the famous naturalist Professor Ritter from Berlin, who approximately 15 years before on one of his scientific journeys explored geologically our valley. Mr Ritter had said that there is a geognostic and shape-like similarity with the region around Libverda and Flinsberg (Swieradow Source), and he also predicted the presence of mineral acidic water in Vratislavice valley due to this similarity. Dr. Ritter was then accommodated at the Golden Lion's inn, and in the evening he spoke about this opportunity with the other guests. 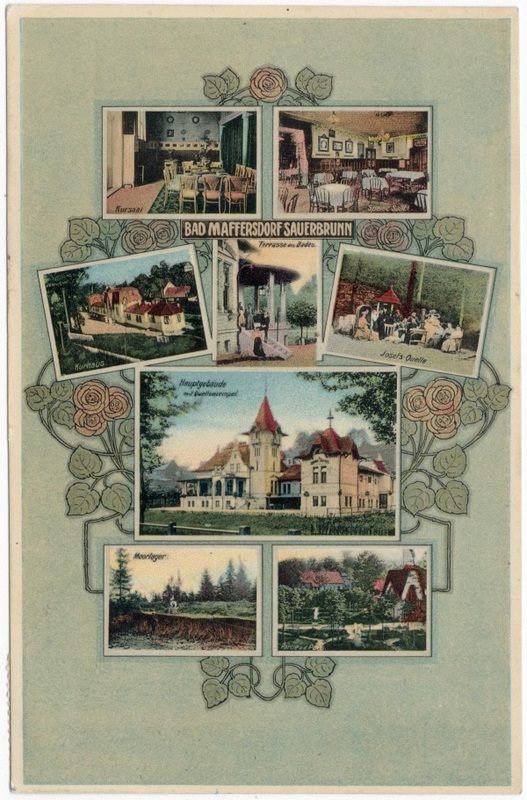 After the news of the newly discovered mineral springs spread, crowds of people were coming from near and far areas, especially from Liberec, to test the strength and quality of this water. On Sunday afternoons the mineral water spring was often surrounded by more than a hundred people who drank from the well and were filling the water containers. Some of them were connecting the water source with their hopes, others shook their heads in disbelief, and they thought it was not really acidic, that the striking flavor came from an adjacent bleach where chlorine and other ingredients were leaking through the lawn. In order to convince the doubters, the owner of the well let the water thoroughly examined by the professor of chemistry at the Liberec school, Johann Jaksch. This chemical analysis provided the following result, which Professor Jaksch published at the Reichenberger Zeitung on October 25, 1865. He also associated the data with the mineral acidic water in Libverda and Flinsberg (Swieradow Source). As a result, Vratislavice mineral water belongs to alkaline ferric acids, as well as the minaral waters of Libverda and Flinsberg. Doctor Eduard Koch says in his work "The mineral springs of the Austrian imperial monarchy": "They have a revitalizing, firming and slightly constricting effect. They are successful in obsolete diseases of the respiratory mucosa, in chronic catarrh, hoarseness, in the stomach weakness and and in diseases of the uterine system." In the spring of 1866, Mr Skolaude had drained the well with stones, adjusted the bleach next to his small house to a spa house, and raised the house and surroundings within his means. In order to get clean water for the baths, he had to pour another well with a pump on the opposite northern end of the site and look! - it also sprouted with mineral water, with significantly higher values ​​than the first. This water comes from an ocher, scaly granite subsoil and therefore has a yellowish color that seems to be clear and has not yet been chemically investigated. Meanwhile, the frequency of visits to the new healing spring has increased favorably this summer, despite the adverse time, due to the good location of the populated village between the two industrially developing cities. Earlier in Bohemia were said "Even Kittel will not help." From here we say "Kitl helps".